Pusegaon is a small town about 40 kms east of Satara in the Indian State of Maharashtra. It is now about five hours by road from Mumbai the state capital. In 1960 it took a day for the same journey. A Unique record In 1960 Pusegaon was a village of about 2,500 people. The University team of six graduates stayed ten weeks to make notes, photographs, film and sound recordings of village life. Their work is a unique record of rural India just 13 years after Independence. 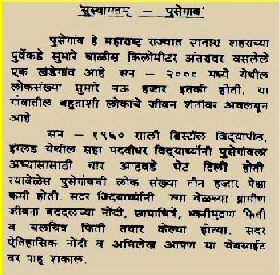 D.N Jadhav was a 13 year old schoolboy when Pusegaon then a village was visited by the team. Now a retired Commissioner of Police of Mumbai DN Jadhav was telling his son about the village of his boyhood. In 1998 he wrote to the Registrar at the University asking about 1960 team , their reports, film and photos. In 2000 the team was invited to return to Pusegaon.